Apr. 9, 2019 12:08 p.m.
More than 15 years since the Progressive Conservatives and the Canadian Alliance merged, a progressive conservative is on the ballot in Nanaimo-Ladysmith. Brian Marlatt will be running for the Progressive Canadian Party in the May 6 federal byelection. He said other parties focus on “movement” politics, power politics and politics of division and said that’s not what Canada needs right now. Marlatt has previously run for the Progressive Canadians in South Surrey-White Rock, but is living in the Lake Cowichan area at the moment caring for his elderly father. Through his own experiences and in conversation with health care professionals, he feels governments are neglecting seniors’ care issues and wants increased funding and goal-oriented health care delivery in an effort to reduce wait times. Upholding the constitution is another of his priorities. He suggested he’s opposed to implementing proportional representation and abolishing the Senate and believes the NDP would do both if elected. “That is in essence re-writing our constitution on the basis of a party’s platform. So that is an issue of moment to all Canadians and it should be in this riding as well as it is elsewhere,” Marlatt said. 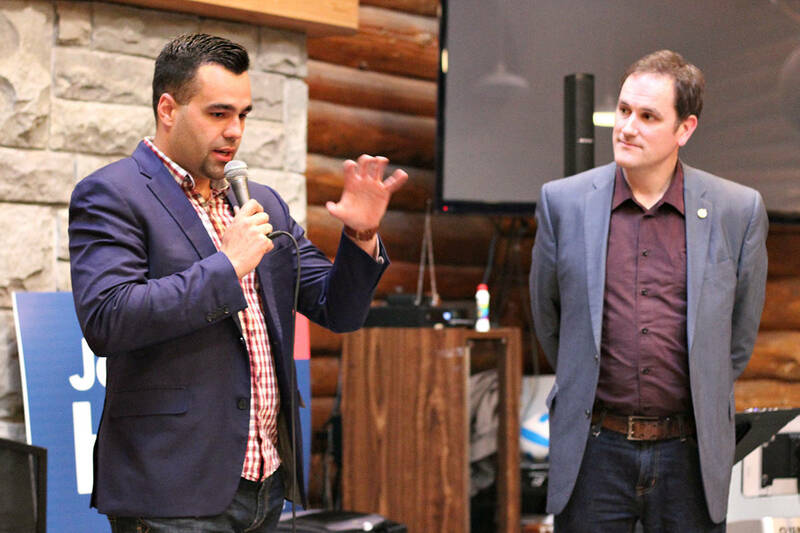 Party president Dorian Baxter, who is in the riding campaigning with Marlatt, said it’s the Progressive Canadian Party’s mandate to stand up for the riding and what’s best for the community, not to shill for the party leader. Baxter suggested the Progressive Canadian Party’s voice is something that’s missing from Parliament. “We are avowed red Tories. We’re blue Liberals. We’re greener than the Greens and our socially progressive left wing runs circles around the NDP because we will attack the causes of poverty,” Baxter said. Marlatt said he’d like to be to the PCs what Elizabeth May is to the Greens and be dedicated to the riding while at the same time showing leadership for his party in the House of Commons. Marlatt received 0.4 per cent of the vote in South Surrey-White Rock in 2011. The Progressive Canadian Party is headed by interim leader Joe Hueglin, a former PC member of Parliament. Other candidates in the Nanaimo-Ladysmith byelection include Bob Chamberlin, NDP; Michelle Corfield, Liberals; John Hirst, Conservatives; Paul Manly, Greens; and Jennifer Clarke, People’s Party of Canada.